This is such a great recipe. And who doesn't have frozen peas? It is quick and easy and delicious. You almost can't screw it up. I can assure of that because I thought I did and it still turned out good. I knew I wanted to make this recipe, so I went out and bought the prosciutto. I had all the other ingredients needed for the recipe. So I thought. Little did I know that the bag of peas in my freezer were nearly a year old. Well it was too late to abort; I had everything prepared up to the point of adding the peas. So I rinsed the peas under cold water and hoped for the best. As I was cooking the peas, I got distracted with income tax stuff that I was trying to figure out. Well I started to hear popping and jumped up to find my peas starting to get dark brown. I thought for sure the dish was ruined, but NO, it was actually still edible! I can't wait to make it again with new peas and my undivided attention! Heat the oil in a heavy large skillet over medium-low heat. Add the shallots, garlic, salt, and pepper, and saute until tender, about 1 minute. Add the peas and saute until heated through, about 5 minutes. Stir in the prosciutto and cook for 1 to 2 minutes. Add the parsley and remove from the heat. Season, to taste, with salt and pepper, and serve. Be careful with your peas! Mmm, this sounds delicious. I like peas quite a bit. Except I think canned peas are gross. 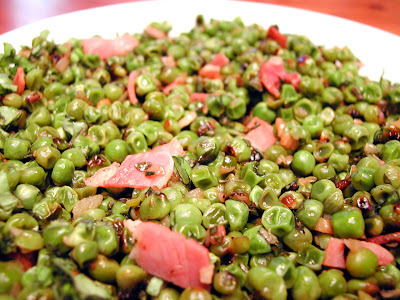 I agree with susan but for some reason peas love that little salty crunch. Super Pizza... for the Super Bowl.